Imagine for a second how food energy from grass, a primary producer, is transferred to a bluebird. The bluebirds don’t eat grass. Rather, they consume grasshoppers—which certainly do eat grass. In this way every secondary consumer obtains life-giving energy and biomass from primary producers through an intermediate, primary consumer. So it is across the ocean, where copepods widely serve as ecologically vital, intermediate links in food chains. 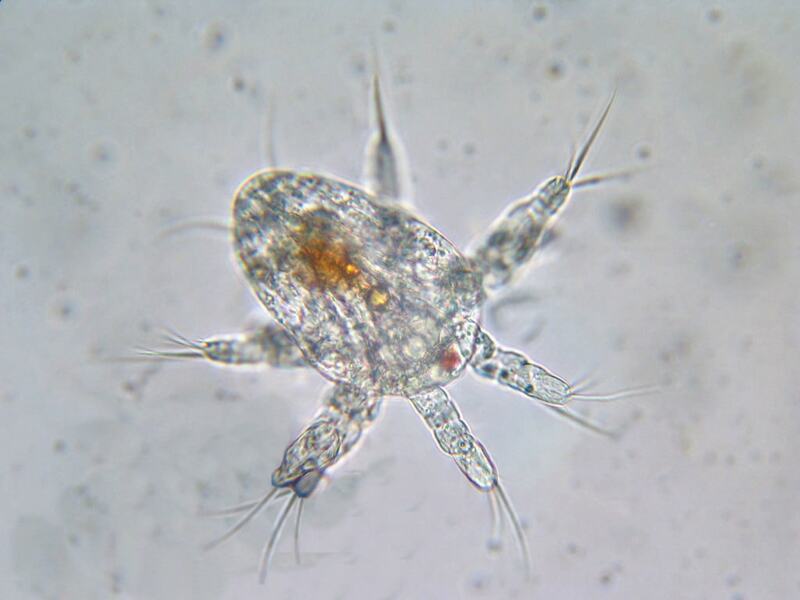 Copepods can best be described as minute, flea-like creatures. They are generally less than a few millimeters in length. Their most basic body plan consists of a large head and sharply tapered anterior. They bear four pairs of relatively simple walking/swimming appendages. They also keep the simple, median nauplius eye as adults. One of their most conspicuous features is their typically elongated antennae. But due to their small size, they are most easily spotted with the naked eye through their lively movement. Whether skipping through the water column or scooting over a rock surface, copepods are exceptionally active animals. Being as they are Earth’s major grazers of phytoplankton, copepods have been dubbed “the locusts of the sea.” Most of these tiny crustaceans are planktonic (that is, dwell mainly suspended in the open waters) during some point in their life cycle. Even many benthic (that is, bottom-dwelling) copepods undergo a planktonic stage. It is during these planktonic stages that they rely most on phytoplankton. Those that undergo benthic stages (which usually take place during adulthood) may consume films or sheets of algae that grow on solid surfaces. While some types might target different types of algae than others, nearly all copepods are herbivorous. And they can be quite numerous. Large copepod populations are thus capable of supporting massive communities of secondary consumers ranging from fish larvae to whales. As marine aquarists are increasingly coming to realize, copepods can also improve the overall health of a captive environment. The benefits of using “pods” such as copepods in marine (particularly reef) aquarium systems became common practice about a quarter-century ago. Copepods are now the most commonly used aquarium pod. A handful of copepod species has emerged as most favored by reef aquarists. Still, coral reefs (and even most reef tanks) are biologically diverse habitats; they therefore have diverse needs with respect to food type and size. Therefore, a mix of copepod species will unleash the most aggressive and thorough kind of herbivory. And marine aquarists love a good herbivore. This is because they universally hate benthic algae. Most benthic microalgae form thin films, sheets or turfs. Not only are these growths ugly, but they also can overgrow, smother and eventually kill desirable sessile (i.e. attached) invertebrates such as corals and sponges. Many clean-up crew invertebrates (snails, hermit crabs, etc.) are included in packages to tackle these forms of algae. Sometimes, even certain fishes are utilized primarily for this purpose. While these comparatively huge animals can indeed help tremendously to control nuisance algae, they cannot always reach within the tiniest cracks and pockets. That’s where benthic copepods come in. The best general-use, live copepod products for marine aquaria contain a mix of species that includes one or more benthic type. Proven to be hardy and nutritious, Tisbe and Tigriopus are long-time favorites. Both Tisbe and Tigriopus are excellent herbivores. Both will additionally feed on coarse organic matter such as leftover fish food. They will even feed on detritus, usually after devouring most of the benthic algae. The two are actually quite complementary together. This is due mostly to their difference in size. Their larval and especially adult sizes differ considerably. We’re talking something less than a millimeter in length for the former; the latter attains 1.5 (sometimes even a couple) millimeters. This may seem insignificant to giants like ourselves, but to the smallish aquarium inhabitants the size differences between these pods is all-important. Sure, even the tiniest Tisbe nauplius is too large for some ultra-fine filter-feeders to consume, whereas the largest adult Tigriopus is too small for some aquarium fish to notice, much less bother with. Still, this pair offers a broad enough size range to support a variety of reef animals from gorgonians to mandarin fishes. Add Apocyclops (which is planktonic as an adult) for the larger-bite zooplanktivores and you’ve got a great-for-everyone live reef aquarium food. It’s hard to imagine why any aquarist would rather resign themselves to the duty of gravel vacuuming and glass scraping than to seed the system with pods. It’s pretty clear why pods are the best thing that has happened for marine aquarium keeping. They eat up stuff in the tank that you don’t want. If conditions warrant it, they can immediately settle into the new environment and begin to reproduce. Aquarium animals will prey on them. In other words, they become an intermediate link in your aquarium’s food chain! In time, an equilibrium will be reached where the population size stabilizes. Copepods are an incredibly nutritious food source, so it’s really great if your aquarium animals consume them. However, pressure from predation may be strong enough to limit the population size in your system. This may be evident by a less-than-perfect cleaning performance. In such cases, the resident population could use a boost. This issue can be resolved simply by adding more pods. For heavily stocked reef systems, regular re-seedings of pods is recommended. This task is effortlessly checked off each week/month by obtaining a subscription for scheduled, automatic shipments of live copepods. Once you get used to copepods doing so much of your feeding and tank cleaning for you, you’ll wonder how you ever got along without them. Purchased ypur pods kit and have tons in the tank now! Thanks so much!!! Thanks for guiding me in what I need to setup a good source to keep a Mandarian thriving! I cannot imagine a tank without copepod’s they do so much for our reef tank’s!